Note: This feature requires an Office 365 subscription and is available for users and organizations whose administrators have configured Sensitivity labels and turned on the feature. Please see this overview of sensitivity labels for more information. You can apply sensitivity labels to your files and emails to keep them compliant with your organization's information protection policies. 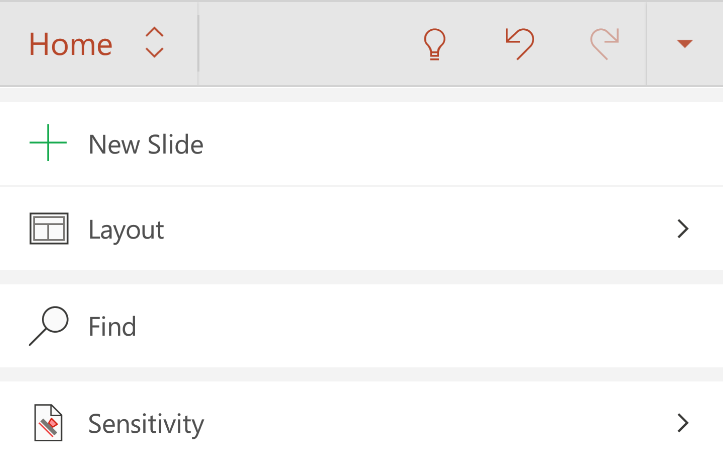 On the Home tab, select Sensitivity. Sensitivity is not visible if your Office account isn't a work or school account. Sensitivity is not available for you if we couldn't find sensitivity labels configured for your signed-in Office account. 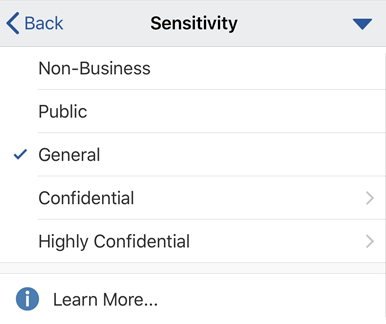 Choose the sensitivity label that applies to your document or email. If your organization has configured a website to learn more about their sensitivity labels, you will also see a Learn more... option. 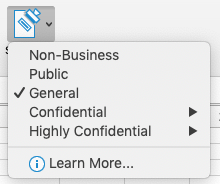 To remove a sensitivity label that has already been applied to a document, unselect it from the Sensitivity menu. On your Android tablet, select the Home tab (if it isn't already selected). Then select Sensitivity. On your Android phone, tap the Edit icon on the top of your screen to expand the ribbon. On the Home tab, scroll down, then select Sensitivity. 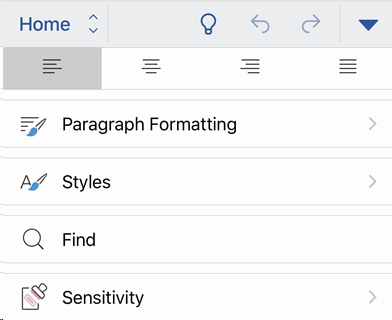 On your iPad, select the Home tab (if it isn't already selected). Then select Sensitivity. On your iPhone, tap the Edit icon on the top of your screen to expand the ribbon. On the Home tab, scroll down, then select Sensitivity. 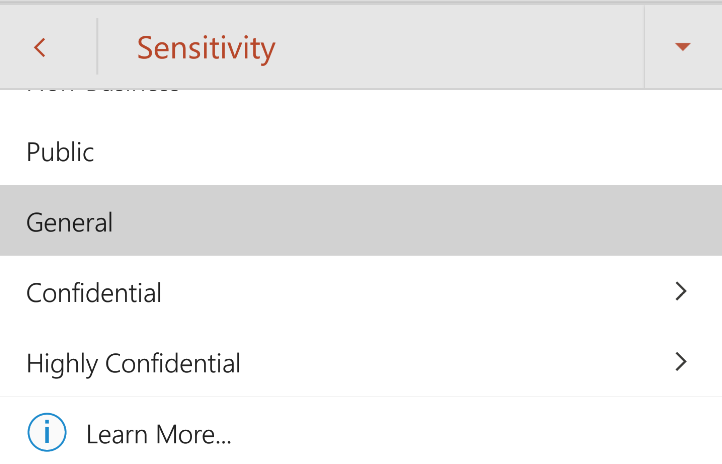 Note: Sensitivity labels must be configured in the Office 365 Security & Compliance center to be available in Office applications. If your organization has sensitivity labels configured in the Azure Information Protection portal, they need to be migrated. What happens when I apply a sensitivity label? Your administrator can have a policy that requires you to provide justification before changing a sensitivity label from a higher sensitivity to a lower sensitivity. 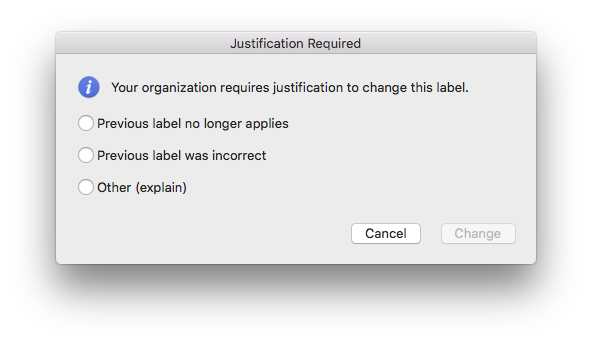 In this configuration, you may be asked to choose a justification reason or provide your own when selecting a less sensitive label. Note: You will only be asked to justify changes one time after opening a document or replying to forwarding an email message. After justifying once, subsequent changes will not require justification until that document or email message is closed and opened again. Where the feature is available today?